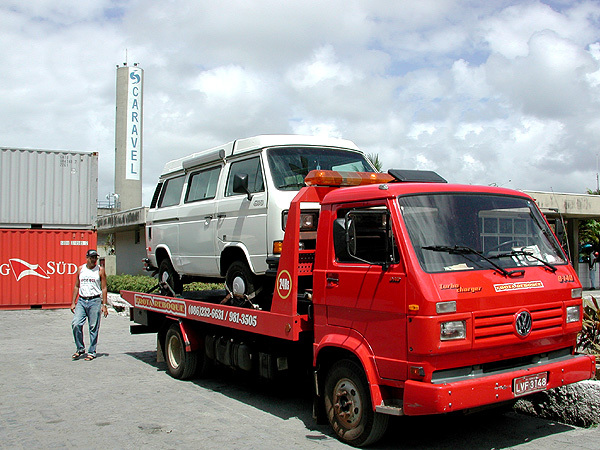 On Friday at 2pm I called APL to get an update on bringing my van to Recife. I had gotten a quote from a towing company in Teresina for R$1,650, and APL had thought that they could do better. Today they told me that the best price that they could find was R$4,000, and that I should take the offer from Teresina. I went to the VW dealership and told them that I wanted to hire the tow truck. After about an hour of calling, they came back to tell me that the truck would be there within an hour, and that I should be ready. I would be riding with the driver to Recife, a thousand miles away. An hour! I took a mototaxi back to the hotel to prepare. Caixas had more mototaxis than San Francisco has cabs. Basically men ride around on a motorcycle with a spare helmet. You flag one down and he’ll hand you a spare helmet (thankfully large.) You climb onto the back of the motorcycle and off you go, anywhere in town for about R$1. It’s actually fun, though it would be much more difficult with baggage. I brought everything up from the van and separated it into things which I needed and things which could ship with the van. I repacked everything, double-checked, and then went over things again. I also topped off the coolant in the van, which was lowered from the last boil-over. I checked out of the hotel, and was ready by 5:30, just as the tow truck arrived. It was a big red VW flatbed tow truck, perfect for syncros, advertising towing service ’24Hs’. The driver was a kid of about 20, scrawny and a little intimidated by my van. Together we got the van loaded onto the truck. I understood the driver’s hesitation. My van looked HIGH up there, like it was going to roll off on the first good curve. But the wheels were strapped down tightly and I trusted that these folks knew what they were doing. Then we were off, down the road to Teresina. On the way, the boy asked me about my faith in Jesus. When he found out where I was from, he asked me if I had ever met Birigram, which I finally figured out was Billy Graham. I said that I thought he might be from my state, and for the rest of the trip, we listened to a Portugese translation of a Billy Graham sermon at high volume. The driver occasionally poked me in the side and lifted his eyes to the heavens, so I guessed that Billy had made a particulary good point. We arrived in Teresina after dark. (It gets dark around 5:30pm here!) I was shown into the tow company office, where about 15 people, apparently all related, were waiting to meet me. Another twenty-ish guy was brought in to act as translator, and he shyly asked me if I wanted water. When I said “Sim!” everyone laughed and several said to one another that I spoke excellent Portugese. I was told that after I drank my water, I’d be leaving for Recife, 1,600 kilometers away, with another driver. I guessed he was the father of this clan, and he was as earthy as the other was pious. Antonio shook my hand, laughed, and asked me if I’d rather have a beer. They told me that we would arrive in Recife at noon the next day, and that if I wanted, we could sleep along the way. Okay, I said, let’s go. Antonio grabbed his duffle, handed me a bag of tools to carry, and off we went. As we were driving through the streets of Teresina, Antonio asked me what I’d thought of Brasil so far. “Estaba una grande adventura” I said. Antonio practically swerved off of the road laughing. “La adventura continua!” he shouted, laughing some more. After detouring around a stopped train (which had derailed), we headed south on the highway. Antonio told me that we were going to head directly across Brasil to Recife, and not go through Fortaleza, which was much further a journey. This would bring us through the towns of Picos, Serra Talhada, and Arcoverde before arriving in Recife. Unfortunately the roads south of Teresina were in terribly shape, and we were driving in the dark. Antonio would often come upon a pack of potholes and smash into one or two before slowing enough to weave through them. My van bounced and swayed on the back of the truck, and I tried to forget it was there. Sometimes Antonio would swerve onto the dirt alongside the road, and the truck would tip and sway. I wondered what my van would look like if we rolled. I wondered if I would have to spend more time in Brasil. We continued to pass fires burning alongside the road, and Antonio told me that they were caused by people throwing their cigarettes out of the window. It’s a little eery to pass by fires in the forest at night. In the dark you can only see the flames, scattered here and there and swaying like dancers. At 2am, Antonio decided it was time to stop. He pulled into an abandoned truck stop and parked in the shadows alongside the building. He slept in the cab and I climbed way up into the van, and we slept. At 4am Antonio knocked on the door of the van. It was time to continue. I dressed and climbed down. And then we were off again. We would stop occasionally for diesel, or water, or lunch, and then we would be off again. The road got gradually better with really bad patches. It was clear to both of us that we wouldn’t arrive at noon. Antonio revised his estimate to 2pm, and then later to 6pm. We hit a new patch of asphalt for a while, and then it was gone. The road stretched before us as a freshly-tilled stretch of mud with a single set of tire tracks leading through it. There was a man with a sign, and it said ‘stop’. A truck came through, and then we were signalled to go forward. The truck slid through the mud, trying to stay on the packed tracks. About a mile in, we encountered a bus coming at us. A really big luxury bus. Antonio stopped the truck. The bus stopped about 50 feet away. The bus flashed his headlights. Antonio opened a bottle of water and drank deep. “La adventura continua” he said in a low voice, and then leaned back in his seat. The bus flashed its lights at us a few more times. Then the doors opened and a member of the crew (there were three) made his way to us across the mud. He and Antonio exchanged some banter, and I was surprised that neither of them seemed angry or raised their voices. The guy went back to the bus, the doors closed, and we waited. Eventually a grader came by, and the bus driver flagged him down. Antonio went out to make sure that his side of the story was heard. After about five minutes, the judge apparently decided in Antonio’s favor. The grader came around and flattened a bit of the mud in a path around our truck. The bus started forward across this path. As it passed us, the rear end slid in the mud, coming within two inches of our nose before pulling away again. Antonio sipped his water. This guy was a pro. We continued on, and the road generally continued to improve. The villages we passed, however, did not. The interior of Brasil is extremely poor. We would pass dirt huts with thatch roofs and without windows or doors. Naked kids ran around the huts alongside pigs and dogs. These small villages do not have trash service, and the residents have not dealt as a community with the problem. As a result, the entire town is literally covered with litter. Waste paper and plastic are just thrown onto the ground. In some villages you could not see the ground between houses through the trash. Pigs, goats, and buzzards pick through the waste. The bushes are covered with shreds of plastic. (You may think I’m exaggerating, and I don’t blame you. It’s unimaginable.) When we passed through these places, Antonio would shake his head sadly. He’d indicate that the people who lived here were uneducated and unclean. And then he would throw his Coke can out of the window. One of the hardest things for me to adjust to in Brasil has been the attitude that littering is okay. People simply throw trash on the ground. I’ve never been able to tolerate this in the States, and it’s hard to withhold judgement here. When Valdir was in my car, I asked him to use my trash bag, and he did. But I felt like I would be overstepping my rights to ask Antonio to change his behavior. I kept a trash bag for myself, and hoped he would see my example and something would click. But I don’t think that he ever understood why I was hoarding trash. At around 2pm, we were held up for an hour while things were blown up alongside the road. I think that they were widening the highway. People got our of their cars and chatted, or simply watched the explosions and pillars of dirt rising towards the sky. At around 4pm, our right front tire blew out. Antonio wrestled the truck onto the shoulder, and together we got the spare down. Then Antonio learned that his jack didn’t work. He waved down a truck and borrowed their jack. An hour later, we were on our way again, without a spare. We still had over 300 kilometers to go. We finally arrived in Recife at just past 9pm. We called my contact at APL and were told that we could not drop the car off that evening. Even though the port is open 24 hours, they only accept shipments during business hours. I told Antonio that I didn’t want to sleep in the van another night, and that I’d pay for a hotel room for the two of us. I had been in the van for 28 hours, and I wanted a shower. We parked the truck at a gas station and flagged down a taxi. I told him to take us to the Hotel Pousada D’Olinda. I grabbed my luggage. Antonio grabbed his duffle, and we drove off in the taxi. We arrived at the Pousada at 11pm. We entered the courtyard, and I nearly fell over. Parked in the courtyard was a high-top Vanagon camper from Germany. This was the first Vanagon I’d seen since leaving New Mexico. I hoped that the owners would be there in the morning. We went off the next morning to find money. I needed some more cash to pay Antonio. But it was election day in Brasil. On nearly every corner, people waved flags and chanted the name of their candidate. Cars drove through the streets beeping their horns or blaring political messages. In Brasil, non-essential businesses are forbidden to open on Election Day. This also means that all of the bank machines are turned off. Luckily, this rule didn’t apply to the airport, and I was able to make a withdrawl there. The taxi driver was loud and never stopped speaking. He seemed to shout everything directly into my ear. I could see the pressure waves eminating from him, pressing me against the door. The sound waves coming from this man distorted not only space but time. Every minute I spent in his car seemed like an hour. He seemed to feel that he needed to act the part of a guide. “THAT IS THE BRAHMA BEER FACTORY!” he would shout in Portugese as we passed a factory with a large ‘Brahma Cerveja’ sign. “THIS IS THE CIVIL POLICE BUILDING!” he would yell as we passed a building marked ‘Policia Civil’. “I HAVE MANY LOVERS!” he yelled at one point, as we passed a love hotel. This man thrived on noise. He would turn up the radio to deafening volumes. I’d turn it down, and then five minutes later he would turn it up again. He was constantly beeping his horn. By the time we left his car my nerves were frazzled. We returned to the Pousada, where Merly Raymond was waiting for us. She apologized and told us that we would not be able to drop the car off that day, due to the elections. We would have to drop it off the next day. She drank a beer (illegal on election day, but not enforced) and we talked for a while. It was nice to have someone to speak English with. She had travelled all over the world, visiting Singaphore (her favorite city), living in London (where she met her husband), and many other ports. She told me to be careful in Olinda… because there were many tourists, there were many people to prey on tourists. Tomorrow hopefully I’ll be able to drop off the van and make shipping arrangements. And then I’ll go home, where I need to be right now. This entry was posted in south america and tagged brazil, travel, vw bus. Bookmark the permalink.